Milwaukee is loaded with personality! Thanks to Don and Diane Beistle for showing me around Milwaukee! Upon your departure from the Milwaukee airport, your first stop should be the Landmark 1850 Inn. This historic beer hall is right across the street from the airport, is loaded with charm, and has 50 taps of great beer. 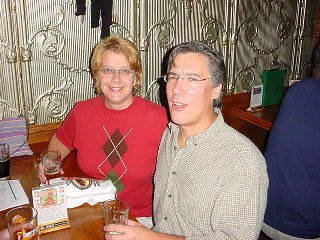 Diane and Don (pictured above) are two wonderful friends who grew up in Milwaukee and introduced us to the Landmark. This is Milwaukee's oldest tavern and is even on the city's registry of historic places. 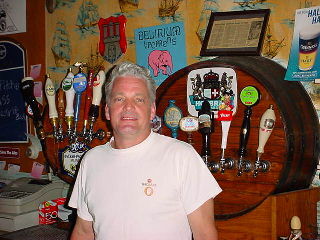 You'll find the Port of Hamburg pub just a couple of blocks from the Landmark 1850 Inn. The building looks a bit like a trailer from the outside, but inside you will be pleased with a wonderful beer selection that includes many hard-to-find German and European imports. 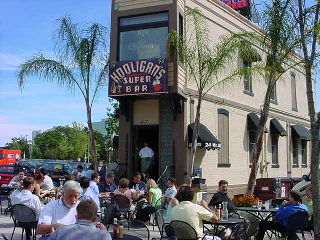 Hooligan's boasts a big draft and bottled beer selection along with good pub food. This sports bar is a popular meeting place for the younger crowd and even has video trivia. Order your food and beer at the counters. Great beer and bowling - what a concept! 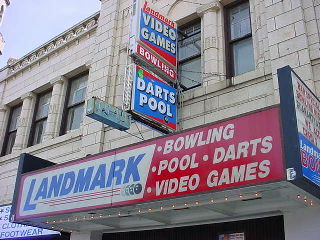 Just a few blocks walk from Hooligan's, you'll find the old Landmark bowling alley. This place offers multiple bars that mostly look like they came from the 1970s, but the beer selection includes some very interesting regional microbrews and delicious imports. Von Trier is very old school German. There is a pleasant outdoor beer garden out back and lots of German beers and food items from which to choose. The wall murals and collection of old German tavern items are fascinating. 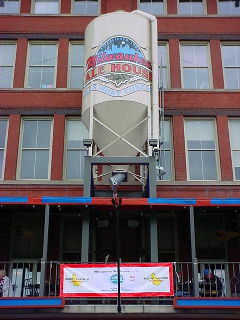 The Sprecher microbrewery is just a short drive from downtown Milwaukee. They produce some outstanding ales and lagers (and are famous for their soda pops too). 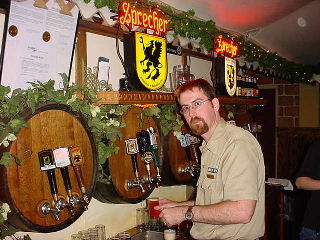 Sprecher has fun tours on Fridays at 4 PM and Saturdays at 1, 2, and 3 PM - reservations are required for the tour. Call the number above to reserve your tour spot. Be ready to share the German-style tasting room at the end of tour with lots of rowdy kids on sugar highs from the sodas. 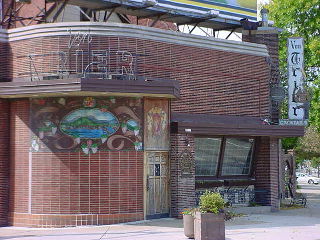 Lakefront is a microbrewery located along the Milwaukee River near downtown. 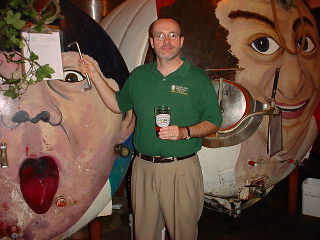 Lakefront was begun in 1987 by Russ Klisch (pictured above) with only sixty barrels of production sold exclusively to taverns within rolling distance of the brewery. Beers include: Pumpkin, Cream City Pale, Belgian White, Cattail Mild, Riverwest Stein, Snake Chaser Stout, and a seasonal Oktoberfest. Tours are offered on Fridays and Saturdays for $5 per person, and Lakefront also conducts a big fish fry for the 6 and 7 PM tours on Fridays - for fish fry info call 414-273-8300. This cool bohemian brewpub features loud music, a beer patio off to the right side of the main bar, and a bistro stand in the back where customers may order appetizers, salads, sandwiches, and pizza. We sampled their Bouzards Special Bitter, Wet Willy Wheat, Bottom Brackett Brown Ale, and Bourbon Oatmeal Stout. All the house beers were interesting but a bit sweet and under attenuated. The photo is of the back entrance of this excellent brewpub. If you have a boat on the Milwaukee River, you can pull up to a small dock under the banner and head into the Milwaukee Ale House for a beer. The bar is decorated with mugs hanging all over and has a rotating cask ale special that is usually well maintained and presented. We enjoyed these house brews: Downtown Lites Honey Ale (wheat and Wisconsin honey), Session Ale (very light and drinkable), Solomon Juneau (golden ale with Saaz hops), Pull Chain Pail Ale (Cascade and Kent Goldings hops), Sheepshead Stout (made with nine malts), and Louie's Demise (malty amber beer with floral German hops and dark toast hints). 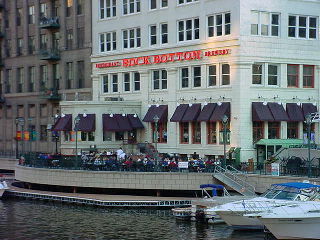 Rock Bottom in Milwaukee is also located right on the Milwaukee River and has a big outdoor patio where patrons can watch the watercraft glide by. This brewpub has several decent house beers and a really nice food menu filled with interesting appetizers and entrees. Their Brown Ale and Stout were our favorite house brews here. 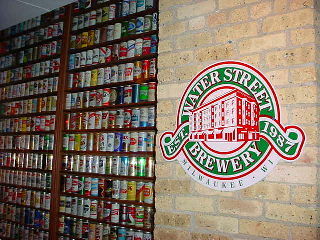 Just a few blocks walk from Rock Bottom (near the Pabst Theatre and Milwaukee Center) is Water Street brewpub. We tasted several nice beers made by brewer George Bluvas III: Honey Lager Light, Bavarian Weiss (complex, authentic flavors), Munich Lager (good German malt quality), Water Street Amber, Pale Ale, and Old World Oktoberfest. 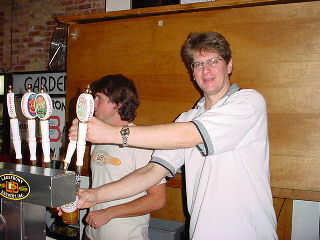 Seasonals are offered that include an Irish Stout, Doppelbock, Scottish Brown, Belgian Wit, and Black Lager. Steaks, fish, pork, sandwiches, pastas, and salads highlight the menu. 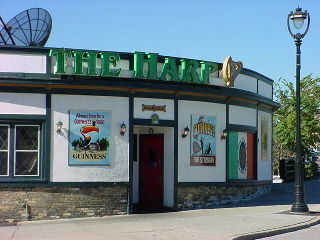 The Harp is a fun little Irish Pub located in an old part of downtown Milwaukee. It has a great pint of Guinness and a relaxing deck that overlooks the river. Miller Brewing is now the second largest beer producer in the United States. Free walking tours of its Milwaukee property begin at the Girl in the Moon Gift Shop and end at their Bavarian-style Miller Inn, with free samples for guests of appropriate age. 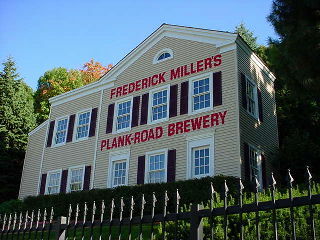 Participants get to visit the main brewery, packaging area, shipping department, and the Miller Caves Museum that is loaded with murals and historic displays. Even if the beer is very mainstream, the tour is worthwhile. 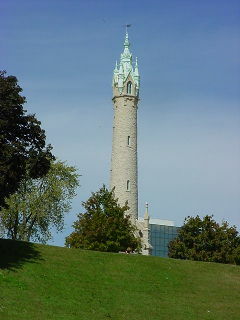 Tours are generally available from 10:30 a.m. – 3:30 p.m. daily. 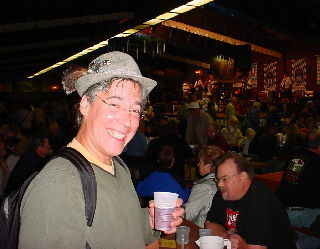 Milwaukee's annual Oktoberfest celebration takes place on the three weekends after Labor Day, and is run by five German clubs in the city. This excellent celebration has food, music, and a good selection of German beers. Old Heidelberg park is the grounds for the event and also is home to the Bavarian Inn banquet center and Ludwig's Bar. Click here for all the information on this wonderful event. Palm Tavern, 2989 S. Kinnickinnic Avenue, ph: 414-744-0393. Some Belgian Ales available. Roman's Pub, 3475 S. Kinnickinnic Ave., ph: 414-481-3396. Great beer selection and appropriate glassware. Wolski's Tavern, 1836 N. Pulaski, ph: 414-276-8130. Tucked away on Milwaukee's lower east side is the old Wolski's Tavern. 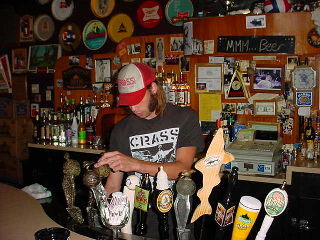 They feature many of the fine beers from Lakefront on their selection of drafts and have darts, popcorn, games, and live music on some nights.